Virat Kohli started his 2018 from he had left us in November of 2017 against New Zealand, scoring a century in the One Day Internationals (ODIs). 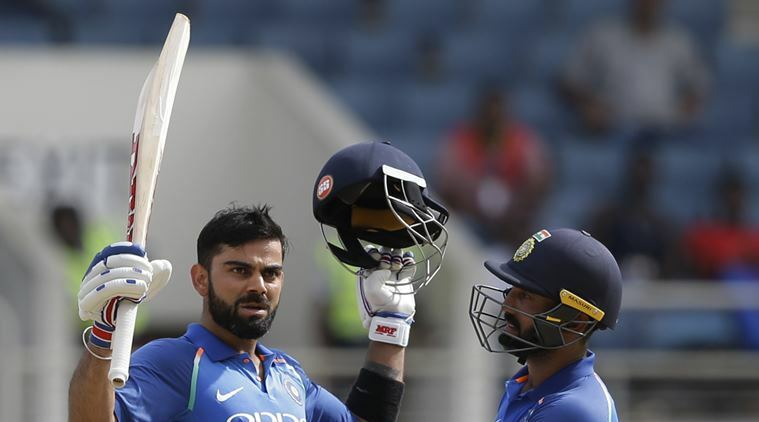 Records galore for captain Kohli as he scored 33rd ODI century on Thursday in the 1st ODI between India and South Africa at Durban. The Indian skipper made 112 from 119 balls to help his side register an easy win over hosts and lead the six-match ODI series 1-0. On the penultimate ball of 41st over, the South African all-rounder Andile Phehlukwayo bowled a wide length ball which was sent through covers by Kohli – 2017 ICC ODI cricketer of the year – to bring his century in 105 balls. Kohli’s stupendous knock came in yet another chase. This was Delhi dasher’s 20th ton while batting in the second innings. It was also his 18th hundred in a successful run-chase. In the record list, he is only trailing batting maestro Sachin Tendulkar who has 49 centuries to his name in ODIs. Kohli also equalled Sourav Ganguly’s record of 11 hundred as a captain. He is now third on the list of most tons as a captain. This list is led by former Australian captain Ricky Ponting who has 22 to his name. Second in the list is the South African batting talisman AB De Villiers who has made 13. This was Kohli’s 19th century outside India. While this was his first century in South Africa it was his second against South Africa. This is also the third instance where Kohli, as a captain, scored a hundred while the other captain also scored hundred. Besides his personal accolades, Kohli was also involved in 189 run partnership with Ajinkya Rahane which sailed the rocking Indian boat to winning coast. This is the second highest stand for India against South Africa in their own home. The highest Indian partnership in the Rainbow nation against them is of 193 runs between Tendulkar and Ganguly in Johannesburg, 2001. Kohli and Rahane also stitched the highest third-wicket stand against South Africa. Be the first to comment on "India vs South Africa 2018, Virat Kohli scores 33rd ODI century, breaks plethora of records"